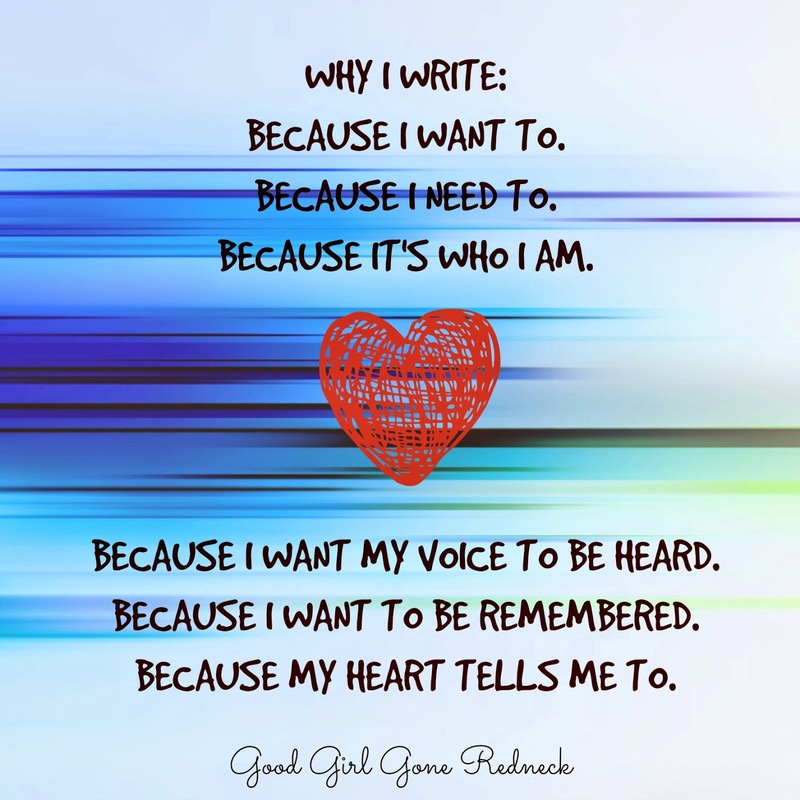 Good Girl Gone Redneck: Why I keep writing. As anyone who blogs will tell you - it's pretty freaking awesome to see your words shared by friends and family. It's extra freaking awesome to see your words shared by people you've never met. And to see a post go viral? Unbelievable. Many a writer has the mindset of - that will never ever happen to me. I know I did. I kind of still do. And I mostly still do, I'll tell you more in a minute. And I'm right in some ways. 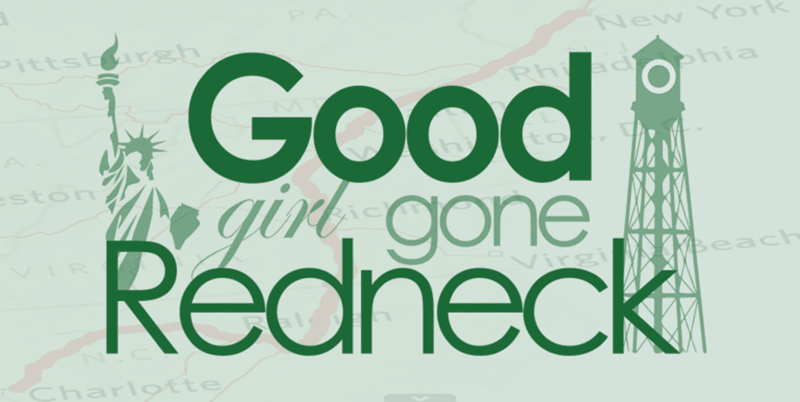 None of my personal posts here at Good Girl Gone Redneck have gone viral. And if you ask me if I'm dreaming of a day that my blog is a household name - sure - isn't everyone? If only just a little bit? And I know, I am the first person to say that I write for me. Because I do. I write for me. But I write for you, too. If I didn't I'd be sticking with pen and paper and keeping my thoughts private. But I'm branching out. I don't know if you've noticed, but I am. In baby steps. And I'm going to tell you why. Because I DO want to be heard. I want to be someone who contributes beyond my own space. It's probably not as thrilling as being the person who creates that amazing space, but it's pretty awesome anyway. To be seen. Heard. This summer I sent my first submission in to Scary Mommy. And it was accepted. When I hit send on that email I thought I was going to be sick. I don't know what got me over that hump, but I sent it in anyway. And they liked it. Cue thought process: THEY LIKE ME! THEY REALLY LIKE ME! Scary Mommy is the epitome of places one would like to be featured. Seriously. The site is very well-known. What more could a writer want? Well, of course, money. Getting paid for your work would be nice. It would always be nice. Scary Mommy actually recently announced they will be paying for original content moving forward. Very cool. However, many of us want to be seen and heard, and we're not thinking about the money when we submit something. Despite what you've heard it doesn't take away from the efforts of other bloggers to get paid for the work they do. This isn't a sponsored post. The site hasn't ASKED you to submit for them. You've made a decision. You've shared your words with hopes of getting them out there. YOUR choice. You may not always get offered money for your work, and it's your call, amazing writer that you are, if whether or not seeing your words elsewhere is enough for you. Sometimes it is. Sometimes it isn't. I submitted to Scary Mommy a few more times since that first post. One more was accepted. Many others have not been. It's okay. Rejection stings, but I'll survive. I recently submitted a post to a site that is sort of a dream for me. It took time, but I got a reply and will be featured soon. Because for that acceptance - in the period of time I sent the email and got word? - I got 2-3 rejections. And again, those sting. They do. No matter how many times you get them. They can chip away at your armor. Chip. Chip. Chip. A few years ago I tried out for Listen To Your Mother. I didn't make it. I understood. I did. But it stung. And I cried. A different kind of cry. A heart-felt sad cry. Unwanted. Rejected. And I've decided for myself that putting my words out there in that way - completely raw and in person - and getting that sort of rejection isn't worth it to me. It's a different kind of chip. It's not one I can bounce back from as easily, and so I protect myself and I avoid it. I'm a huge fan of many of the women coordinating LTYM across the country, including the two in my own area. I didn't take it personally, I still like them, still call them friends, but I also knew that to hear another no from them would cause an ache I wasn't ready for the following year. Or the year after that. And so on. And back to viral posts. Crazy when you see the same post shared and shared and shared across your Facebook feed, isn't it? It's that post when someone reminds a mom that they're doing their best or the one where there's a reminder not to judge because you don't know what the other person is going through. I love those posts. I SHARE those posts. But *my* viral post wasn't one of those posts. It was a post I wrote for SITS on books. I'm an avid reader. I have more books in my home and on my Kindle than I know what to do with. It's a bad addiction, but a very good thing. Give me a Barnes and Noble coupon and I'm all in. No matter how many books are in my to-read piles or on shelves, or, who am I kidding, on an entire (almost) bookcase. Anyway - that post blew up. It went everywhere. It resurfaced. Authors read it. It got hundreds of thousands of Facebook shares. I'm not kidding. Okay, sorry, I am kidding. I just went to check and it's been shared on Facebook 1069K times. What? *shakes head. rubs eyes* What? I keep taking a screenshot because I just cannot believe it. But it's true. It's there in black and white. And color. Me. My words. Gone pretty much everywhere. Okay. Submit posts. Get accepted. Get rejected. Cry. Go viral. Don't. It's okay. You'll be okay. That about covers it. Kind of - sort of. This is on its way to turning into the longest post in creation and if you got this far I thank you. I don't usually talk this much. On screen, anyway. My point is this. If you want your words to be seen? Write them. Share them. Submit them. Get out there and take the rejections. Sure, they'll hurt. Some more than others. Some might even make you cry. But it doesn't mean that someone else won't accept your words and before you know it you'll be taking screenshots, too, just to remind yourself that sometimes you're pretty amazing. Which you really should know by now. Without that extra validation. And yet, we admit it, we writers? Sometimes we need that. And it's okay. We're allowed to need it and want it and crave it. As long as we remember that isn't the only reason we write. Because we do still, somewhere in there, almost all the time, have that need to write that's just for us. It keeps us who we are. I write because I have to in the same way that I have to breathe. It truly is how I process my life. I know that feeling of they like me...they really, really like me. I've been featured and write for almost everywhere BUT my humbling moment came when Mamalode published me because I felt like it is a magazine that writers read and for my peers to acknowledge that it was good, validated me in some way. Also, when I was selected to read at the We Still Blog awards at Type-A, it was one of the most humbling moments of my writing career. To move people with my word, to express feelings that they can truly feel and be affected through my words, that feeling is amazing beyond words ( at least not any that I can come up with.) You are amazing as a person and a talented writer, you will go VIRAL many more times...I am sure. Look at you go! I'm super happy for you :-) May you have many more virals in your future. Andrea, I love your words. Rejection is so hard not to take personally. Keep writing, and keep submitting. I write to help me process and to tell my stories before I forget them. You made me smile the entire way through this post. I love that you've been writing your heart out since I entered this space and you still are. I love your honesty. I think this is the first time I've been here and I like your "voice" and your words. I also write because I want to be heard (among other reasons, but if I didn't want to be heard I could keep a journal, right?). And I haven't gotten up the nerve to submit to anywhere yet so good for you for putting yourself out there! I needed this today. Because I'm looking to branch out, but I keep hesitating. Because it's been a long time since I've felt that sting of rejection, and I don't know if I'm strong enough to take it now. BUT. I want to write. I NEED to write. I am a writer. And I want to share my words beyond my own site, as much as I love it there. And so if you can be strong enough to feel that sting and still keep on, then so can I. Thank you lovey, a million times. I love this post and totally get it - your heart, your passion, your feeling. I know this . Thank you. Also, can't wait to see where you will be published next - so exciting and I am dying to know! You deserve it all writer friend. I miss it...writing and blogging... I miss it so much, but I've gotten so far away from it... for good life reasons... that I don't even know where to start, but oh how I miss it! I'm excited to watch your post go viral. Congratulations. I also write because it gives me great inner pleasure and pride. It's also therapeutic. You know, I Can't say anything other than, Yep. I agree. Are you doing BlogHer this year? I hope to see you there. Writing is cathartic. I thank God daily for the gift of writing. I write because I can. I write because I have something to say that needs to be heard. I write because its a great form of expression. I'm SO excited for your dream acceptance. Can't wait to read it. I have been so blocked in my writing lately. I needed this reminder to get back to the heart of what it is all about. Thank you for this. There were a couple of rejections in my life in the last few months, and they did sting. It is good to remember that there is a writing life beyond the rejections. Thanks for the pep talk! Now back to the drawing board. Perseverance paid off! Good for you and good pep talk. I find it a tricky balance to navigate, figuring out what to keep, and what to put on my own blog. Still haven't figured out how to manage that balance. At first I was like, SUBMIT ALL THE THINGS! and now I'm realizing that I need to focus on my blog, and use submitting elsewhere as...a dessert, rather than a main course...if that makes sense. Well said...I love that your viral post is about books. Great post and congratulations on your successes. I write for me, to get my thoughts out of my brain, but I also hope that others will see themselves in my posts and be helped by the shared experience. Stopping by from Saturday Sharefest. I loved this and found myself nodding and agreeing all the way through. Writing is like breathing but getting noticed is like sunshine. I felt the exact same thing when Huffington Post emailed me and asked me if they could publish one of my pieces. I don't think I've ever been so proud of myself in my life. It was the best day ever I didn't submit myself because I didn't have the nerve. Going viral is a rush, isn't it? ... but then, how do we go back to the norm? I so adore you! I smiled as I read this post because I could hear you speaking them. Then it made me cringe a little, not because it was bad, but because it was good and correct. 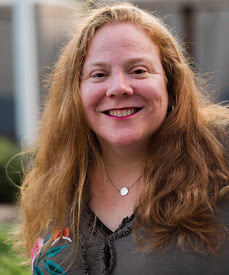 I am one of those bloggers (I still don't call myself a writer) who does NOT submit to other places because I'm afraid I cannot handle the rejection as wonderfully as you do. I'm going to ponder this a while and TRY to think about submitting something to another site - just to share my words, my voice, my story. Loved this. So true...as a blogger and writer. Congratulations ~ I agree, you've got to keep putting yourself out there! Writers must have a tough skin, whether bloggers or best sellers. Keep going! And congrats on your success. I can't imagine everyone accepting my first, second or 982nd draft of my work. I have a love/hate relationship with rejection because even though it hurts I think it makes us better writers. I am with you about the writing for me first thing, it is just how it is. I was published on Scary Mommy this year, I didn't submit, I got an email asking if they could run one of my posts and I was amazed. I've submitted twice and been rejected and that's ok. I took a screen shot of Jill's email about my post, just so I could remember that this type of stuff does happen. Ah, I know the sting of rejection well. But now that I'm on the other side of receiving submissions, I can tell you that each time I have to send out out, I hurt too. Because as a writer who also sends her words out there, I am in a position to know what it means. So know that it's not because you're not good, it's because in that moment, those words you sent in may not be the right fit. Or it's wrong timing. But trust the process. So happy for your SITS post!